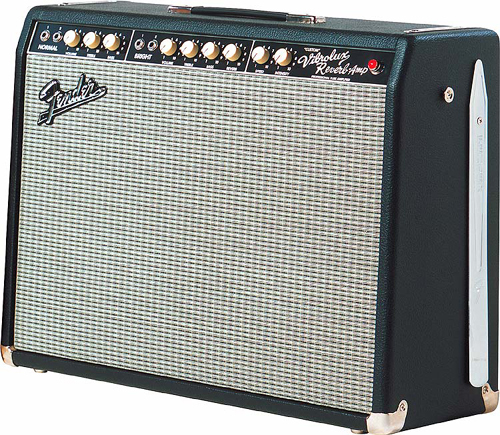 Comments: Later models have black Tolex, silver sparkle grille cloth, and round white knobs. I bought The “CVR” and put it through some modification that really helped. After a quality re tubing, I had all caps replaced with F&T and other highest quality caps. This quieted the amp down a great deal. It was a John Fromel “Supreme Cap Kit”. Then I had the second Fromel kit installed. This kit contained “The Moyer Mods” plus other changes to the tone stacks to the degree that it’s now a “Vibroverb” circuit.This brought out the reverb, ended the very early breakup quite a bit. This is the only Fender product that I have owned that actually required modification for me to like it. Channel one is brownfaced while channel 2 is blackfaced. It has the most beautiful tremolo I’ve heard. The 10″ P10R’s are fine for now. If I needed to turn it up substantially, I would perhaps disconnect those and use a 2×12″ cab. Indeed, it is a noisy amp, but…it sounds amazing, very touch sensitive and more dynamic than say a ’65 Deluxe Reverb RI, ’65 Twin RI, Super Sonic 22, etc. The speakers really fit the sound of this amp. The reverb is a little thin and weak, but the tremolo is fantastic. Gets a little crunchy around 3. Very loud amp. 4 major pieces and you can have a Super Reverb ala the design’s 40 watts or as a Bassman’s mode with a nice biting tone but with Trem & Reverb! It’s capable of a real nice headroom and with a lower gain twin triode,..you can use it for the Tele&Strat on one channel and the Les Paul&SG on the other,.. and at the 40 watts when tube rectified there’s 45 watts as the usual with the Solid State Rectifier and it’s loud! The extra 5 watts may not seem like much but when it counts in the saturation from 9 to 10 the break up sweetens up! Jesse, that is an interesting concept and one I haven’t considered. I recently purchased a 95 fender custom vibrolux reverb and it was not the cleanest of amps from abuse. As you know Fender builds a tough product whether its a guitar or an amp and I have a fondness for every product I’ve owned with the exception of SS amps. I have a short buzz that accompanies the played note, I don’t know why but I have to take it in to get addressed. Because of your post I am wanting to know more. I am familiar with the Moyer mod, I bought the amp because it was clean and pure at a low volume but the amp turns into a beast after 3 and thats quite loud for my ears (sensitive). I am interested in what you said in regards to “keep the reverb and tremolo intact”. I thought the Moyer mod’s main purpose was to get rid of the hiss which was mainly provided because of putting reverb on channel number 1? Could you elaborate more on your modded amplifier. I’ve got one, I like it very much. I think people think it’s supposed to be a blackface sound, but it’s more brownface. The knobs.give it away. Replace the reverb tank with a three spring 9AB3C1B. Reverb will be lush and controllable. I bought mine used in 2008 or so at Parkway Music in Clifton Park, NY to use for recording. My only worry when I bought it was that it was a bit noisy. The owner switched out the 12AX7 in the #1 spot for a 12AT7 and that fixed it for me. Nice and quiet. As far as Blackface/Brownface; I’ve owned at least 7 Blackface Vibrolux Reverbs since 1968 and I am super happy with my CVR. I DO use a Fender Princeton Recording amp for recording now. It is the BEST!! I owned a Custom Vibrolux reverb. Bought it on e-bay and was highly surprised @ how noisy it was. Had the Fromel Supreme installed and it is one of the finest amps I’ve ever owned. I have always wondered why Fender let this amp out until they figured out how to make it right.